Fractions, Fractions, Fractions. 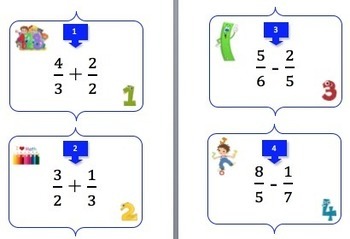 This 16 Fractions Task Card resource covers addition, subtraction, multiplication, division, word problems and is very unique. 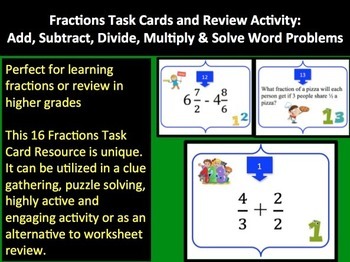 It can be utilized in a clue gathering, puzzle solving, highly active and engaging activity for those learning fractions or as an alternative to worksheet review for older students. Do you use Math Workshops in your class? These would be perfect! This activity covers the Common Core Math Standard - 5.NF. Do you like these Task Card Activities and want to save some money? I've bundled all of my Elementary Task Cards sets in one place and marked the price down 44%. CLICK HERE TO HAVE A LOOKBuyer Comments: "I love them, thank you for sharing." "Love using these in my small groups and for math review." 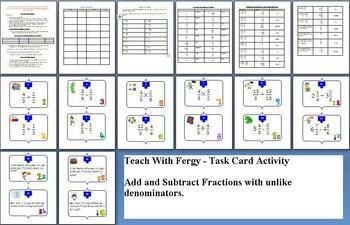 "Looks like a fun task that incorporates a lot of the fraction skills." "What a fun way to practice fractions. Like how it covers so many operations and can be used in multiple ways. Like the quote." "Thank you for sharing your creativity and hard work with others!" You may also be interested in these other Task Card Activities. Please view the preview file to get a better idea of how you could utilize this resource in your classroom. Buyer Comment: "Great resource for stations!" 1) Task card review game - lots of fun! - Students are placed in groups of two and have to work their way through the task cards. Each task card answer leads the student to a clue (a word). - Once the group has completed each task card they will have enough clues to solve the puzzle. - Once the group has solved the puzzle, they are the winner. 2) Typical task card review. - The cards work well as cue cards, test review, etc. I also have other Task Card resources as well as a range assignments and lessons/units from other grade levels at my store. Please come, have a look around and don’t forget to follow if you like what you see.